❗ Clearlift - Non-ablative lifting in beauty salon in Krakow! 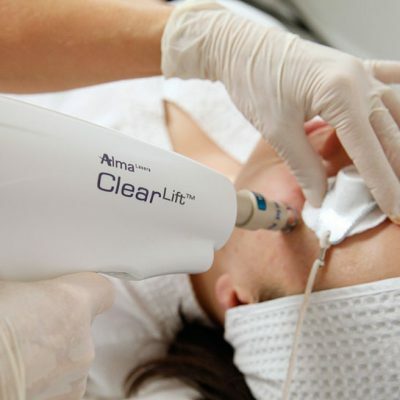 Alma Lasers ClearLift is the most comprehensive Q-Switched Nd:YAG treatment solution available today. The innovative technology provides a controlled dermal wound deep beneath the skin (up to 3mm in depth). The outer layer of the skin is left undamaged. All stages of healing and skin repair occur under the intact epidermis. What is the Non-ablative lifting ClearLift treatment used for? How long the treatment take? Clearlift is painless and precisely adapted to treat delicate areas. It‘s first fractional non-ablative Q-Switched laser, It allows practitioner to use the powerful benefits of a high intensity Q-Switched laser for the treatment of age-related skin imperfections f.ex. wrinkles, photodamage, uneven skin tone, fine lines or skin laxity. Clearlift is safe and very effective. It can be used even for thin, sensitive skin and for the areas such as the face, neck and décolleté areas. The energy of the laser is focused benath the epiderms, this creates a controlled dermal wound while leaving the epidermis intact. It stimulates growth of new collagen as well as contracture and tightening of the tissue. Clearlift is often called as a „lunchtime procedure“ because it doesn’t require any downtime and anesthetic. It safe for all skin type salso during summer time.